Teaser Tuesday: What’s for breakfast in early New England? 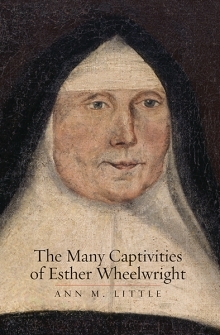 Readers of my book in my book, The Many Captivities of Esther Wheelwright might well wonder: is Ann Little a huge glutton? Or was it just too close to lunchtime when she wrote some of these chapters? To answer your questions: yes, and almost certainly! What’s for breakfast, lunch, and dinner? are questions on my mind every day, so I thought it would be an interesting question to answer when writing about Anglo-Americans, Native Americans, and French Canadians alike. The answer to that question–what’s for dinner?–was also an interesting way to explore some of the differences as well as some significant similarities among the peoples of the northeastern borderlands. As it turns out, the answer to that question was a lot more similar when comparing early New England and Wabanaki communities; when Esther moved into the Governor’s mansion, the Château Saint-Louis, in Québec, that’s when her diet took a gratifyingly rich and nutritious swerve, one that was for the most part sustained inside the walls of the Ursuline convent. Future Teaser Tuesdays will explore the what’s for dinner? and the what’s for supper? questions in those locations. As Mary Wheelwright, Esther’s mother, stoked the fire to prepare breakfast, wood smoke would furtheragain permeate the hair, skin, clothing, and all of the personal belongings of the entire family. Because of its pervasiveness, winter and summer, Esther may not have been consciously aware of its acrid yet comforting odor. In colonial America, the smell of wood smoke was the smell of home—whether home was just a temporary camp in the woods, a dugout on the banks of a river, a Wabanaki village, a New England wood-framed house in an English settlement, or a stone house in Québec, wood smoke promised light, heat, and cooked food—not to mention human companionship. Esther would not have been permitted the luxury of sleeping in while her mother worked to feed the family—she was probably expected to assist her mother with simple tasks like setting the table for their breakfast, and helping her younger siblings into their clothes (five- year- old Jeremiah, three- year- old Elizabeth, and little Mary, only fourteen months). On most mornings in Maine, Mary would probably have given her family a breakfast of small (low- alcohol) beer or hard cider and hasty pudding, a cornmeal mush sweetened perhaps with maple sugar or molasses and enriched with milk and butter.) But in the summer, if the air was already too muggy and warm for hot cereal, then the family might have made do with a cold breakfast of cheese, leftover bread, and the remains (if any) of last night’s supper. Aside from helping her mother at the table, Esther may also have been responsible for keeping her younger siblings entertained and safely away from the fire. 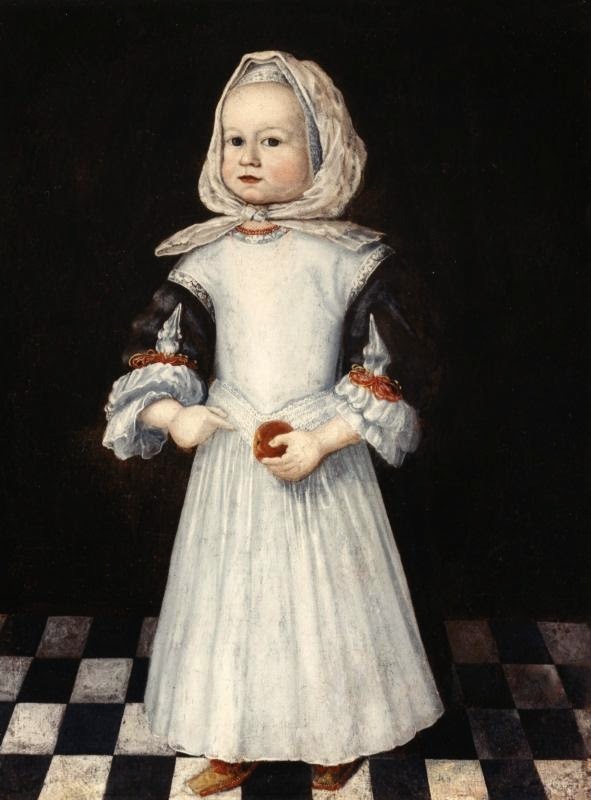 Little girls in colonial America had to learn at a young age how to work cooperatively with other girls and women, because all but the most elite of them would work alongside other women for the rest of their lives. The Wheelwright family was a prominent family in Wells, but neither rich nor elite. Although they typically kept servants and even owned slaves, Esther and her sisters were raised to work like their mother. Portrait of Alice Mason, ca. 1670, courtesy of National Park Service, Adams National Historical Park. See what else I have to say about little Alice on p. 20! English and Anglo-American girls and women especially would have been inured to the smell of wood smoke, because so much of the work they did year-round happened indoors or close to the threshold, and usually with the assistance of fire. Fire not only heated homes and cooked breakfasts, dinners, and suppers, it was essential to dairying, it heated water for laundering bedding and clothes, and its warmth helped bread rise and beer ferment. While boys in agricultural communities like Esther’s elder brothers John, age thirteen, and eleven-year old Samuel were expected to assist men with tasks performed largely out of doors like farming, herding, maintaining farm tools and equipment, and sometimes hunting and fishing, girls like Hannah and Esther worked side -by -side with their mothers, sisters, and women servants and slaves at the endless rounds of domestic labor required to maintain a middling Anglo-American household. Cooking, washing up, and milking too—if the family kept cows—had to be done at least daily, if not two or three times a day, while other tasks needed bi-weekly, weekly, monthly, or only seasonal attention: baking, brewing, gardening, butter- and cheese -making, food preservation, washing, mending, sewing, and knitting for example, were skills that took years of practice before most girls would be proficient at them. While men’s and boys’ work was more frequently outdoors, women’s and girls’ work was not necessarily less physical, considering the strength and stamina needed to work with large animals, beat or grind dried whole grains into meal and flour, and boil laundry in enormous kettles—sometimes all in the same day. The work that women and girls did was equally arduous, but more confined, bounded as it was by houses, kitchen gardens, barns, and perhaps larger yards for messier tasks like laundry and food processing. —The Many Captivities of Esther Wheelwright, 21-23. That’s all for this week–join me again next Tuesday, when we move into chapter two and Wabanaki life at the turn of the eighteenth century. La vie quotidienne–I think people are always curious about it. What Emil du Bois-Reymond ate for breakfast: bread and milk. Fancy lunch he had at a restaurant in Bonn in 1838: egg-drop soup, boiled meat with cucumbers, fried potatoes, spinach with ham, roast beef, and salad. Exotic produce from his garden: rhubarb, peas, parsnips, French carrots, fresh tomatoes, sweet corn, New Zealand spinach, English melons, and strawberries. Delicacies for the occasional splurge: Edam cheese, pickled ginger, oysters, and champagne. This menu & garden sound a great deal like what’s for dinner in Quebec at the Chateau Saint-Louis and at the Ursuline convent school! As you will see, in a future Teaser Tuesday. . . Question: du Bois-Reymond marveled at the quantity and quality of meat that his English colleagues ate. Did English colonists likewise eat more meat than French? Anglo-Americans undoubtedly consumed more beef than either their English or French peers (see my reply to Profane below), but French Canadians were also big meat eaters: beef was big (as I discuss in chapter 3 when I write about the menu in the Ursuline convent), but so was pork, moreso than in New England. Cod? Clams? Given the location, to what extent was seafood part of the regular diet? Anglo-Americans preferred beef, fresh or salted, precisely because it was more resource-intensive to farm. Animal husbandry was also a mark of a particular kind of civilization, as it set English and Anglo-American colonizers apart from their Native neighbors. TNX – it has been a while since I have read any scholarship on this, and I was wondering if the poverty food/consumption as a class marker angle was still current. TNX. Where was game meat in the hierarchy? Back in England, game meat consumption was one of the principle markers, food wise, of conspicuous wealth until the most restrictive laws on hunting were relaxed in the 1830s. Did a “democratic” hunting culture amongst Anglo-Americans, and, of course, their native neighbors, result in cultivated meat replacing game meat as the status symbol? How did this compare with their French neighbors? (If you have more bibliography to throw at me, I am all ears – sounds like what I should really do here is buckle down and read your book 8-P). Great questions. Farmed meat through at least the 18th C was more prestigious for the reasons you cite: there was a democratic hunting culture, and hunting meat (versus farming it) was associated with Indian men, and so seen as less prestigious & less civilized. You should read my book–but for the real 411 on farming & animal husbandry in early America, see V. Anderson’s book (above)–it’s truly one of my favorite books in early American history published in the 21st century. By the middle of the 18th century, New England was producing more and more herd-stock food, and less and less field cropped food, because of the hilly terrain, climate, and stony soil, the inability to compete with Middle Atlantic farms for grain production, and other reasons. During the American Revolution, army commissaries and contractors drove meat on the hoof south from western Connecticut and Massachusetts to army camps in New York, New Jersey, and elsewhere, and shalloped flour north from expanding grain farms in the upper south. Your advisor, Historiann, is one of the few people who still use the word “supper” in its proper early modern connotation, of a light meal at nightfall, rather than as just a regional variation of “dinner,” a hearty meal at or after nightfall. I think the sound of the phrase itself in that context is just delicious!